I haven't smoked pot in many years, but I certainly enjoyed it a lot at one point. I've seen every variation of outcome. Friends of mine who were struggling with demons smoked pot for awhile and then moved onto harder drugs and various disasters (such as death). Others who smoked pot ended up becoming lawyers and doctors etc. Many of them are just regular folks, some of them who still smoke a bit of pot. I have no personal experience to suggest that the people who ended up spiraling out of control wouldn't have done that even if pot didn't exist. In my opinion, there are points in life where people on different trajectories all happen to be in roughly the same place. My consumption of alcohol is nothing like it was at age 21 when I was living in a house in Banff with 6 roommates and working in a bar. For many of us, that was the peak of our alcohol and other substance consumption, and after a few months I was tired of it and moved on. Some of us were just getting warmed up, and have spent the last 25 years getting further into addiction and self destructive behaviours. None of our trajectories were caused by marijuana, it was just there. The (future) drunks and addicts were on their way there anyway. This is the problem. People who choose to abuse substances don't do so just because they want to break the law. This is proved by people who choose alcohol instead of something that is illegal. It is a form of escapism that, for some people, is hard to resist, and unfortunately it becomes something that people become dependent on - being able to escape the situations in their lives that resulted in them turning to this. The war on drugs is just the governments' way of trying to attack a symptom of what is actually a far deeper problem; the problem with our system as a whole that allows for ordinary people to feel the need to turn to substances in order to get away from it. In an ideal world, everyone would have a sufficient support network of meaningful connections with other people that create an atmosphere of happiness and fulfilment where they do not need to turn to drugs just to cope - because there is no harsh reality for them to feel the need to escape from. I know this sounds like an idea from la la happy land, and may seem far from achievable. Indeed it might be unachievable, but we can start by treating addicts as victims rather than criminals. That's why I support legalisation. Great links. Very thought provoking, although I am not totally convinced that legalization is the answer. You've given me a new topic to study though so thanks! Report from one of the of weed consumption capitals of Canada - Vancouver. Interestingly, while I was expecting to see a lot more people smoking weed publicly (at least temporarily), there doesn't seem to be any difference so far. I wonder how much the shortages are playing into that. I don't think there's any shortage of weed in Vancouver. BC has been the weed production capital of Canada for decades. There is no shortage of weed in BC whatsoever, including in the legal avenues. Side note, I own a commercial property in a small town. About 65% of the other buildings on my block are all or partially given over to legal marijuana production. And they have been for some time now. The reality is that any shortages on the legal market, at this point, are more than covered by the black market. That will likely change as legal weed supply chains get more mature in the other provinces, but I doubt one single weed consumer has had to 'go without' any time in the last 30 years around here. I would like to have a little jar of marijuana gummies by my bed for nights I have trouble sleeping. I live in Washington. I don't know if substitution has been studied specifically. I imagine pot and alcohol are often used together. I do know that there has been no increase in minors using marijuana, and there has be no increase in traffic accidents. There has been an increase in insurance claims however. Adult usage has increased quite a bit, but still only a small percentage of the populations partakes regularly (14%). IIRC, the state collects more marijuana taxes than liquor tax, and Washington has the highest alcohol taxes in the country. Michigan just voted to make it legal. Sounds good from the tax issue. How's that work for border crossings? If it's legal in Michigan and legal in Ontario, do the Feds still roust you out of the car and clamp you in leg irons if you possess a bit? Would it only be illegal at the crossing point? Will they chemically sample my brownies? Re: Canada legalizes marijuana, what does everyone think? Marijuana is still a Federal (US) Schedule 1 illegal drug. Even in states that have legalized it possession is still a Federal crime. Crossing state boundaries would involve Feds via the interstate commerce clause in the US Constitution (used by the Feds to grab power). Borders and airports are Federally controlled places, so be careful out there. Getting a prosecutor, (often an elected official) grand jury, judge (an elected official), and a jury of peers to get a guilty verdict in a legalized state might be interesting. It probably might be used to confiscate assets (cars, houses etc), not to actually get a verdict. Don't know if Fed law has been applied in full legalization states, I know in medical marijuana states, it was applied a lot. Non-US note, Schedule 1 illegal drugs also include heroin, LSD, ETC. Morphine is not in Schedule 1, as it has "approved medical uses". As far as the federal government is concerned, marijuana is still illegal everywhere, not just "at the border". Federal agents kinda sorta look the other way in states that legalized it, but that's just Uncle Sam trying to be conciliatory without really giving away legal supremacy. The border is this weird place where not only you temporarily surrender your usual rights, and it is entirely run by federal agents. They are trained to be on high alert and all their rules apply. Now as markbike528CBX pointed out, there is this whole interstate commerce thing going on, and things get complicated. I live in Washington, which not only legalized marijuana a while ago. Let's think about the implications of driving around the Pacific Northwest with a bunch of joints in the trunk. 1) Driving within Washington: no problem. You'd have to somehow be stopped by federal agents. Sure there is this law that says anywhere within 150 miles from the border is "the border" and you can be stopped and searched at any time for no reason, but in practice the odds of getting in trouble are minuscule. 2) Driving from Washington to Oregon: probably no problem. Both WA and OR have instructed their law enforcement to not do anything and not report it to the feds, so the odds of getting in trouble here are just as low as in option #1. 3) Driving from Washington to Idaho: bad idea. The Idaho state trooper was NOT instructed to let these things go. They charge you with some state crime, and upon learning that you came from out of state, refer the case to the feds and tada, you get trouble from them too. 4) Driving from Washington to BC: very bad idea. It's only a matter of time until the rest of the dominoes fall like a house of cards. Checkmate. Adult usage has increased or the number of adults who admit to usage has increased? Well that's the million dollar question. And it's one that, by definition, it's going to be impossible to answer statistically. New York will legalize soon. The state Senate finally went blue and Cuomo has already started the process. Does anyone know exactly how this data is collected? I've only ever heard of polls and it seems pretty obvious that people are going to lie about whether or not they're breaking the law, even if the polls are anonymous. Based on the bolded I'm guessing the data is lacking? For legal usage you can get good total consumption data because of detailed tax records. At least in states like CA you also have to show ID each time you purchase, so presumably it would be possible to distinguish between a few heavy users and many moderate to intermediate users. For illegal usage, I don't know of a data source other than surveys or similarly biased things like looking at drug test results (people who think they will fail will tend to avoid actions that require taking them in the first place), or arrest records (says a lot more about changes in police enforcement policies/resources than adult usage rates). 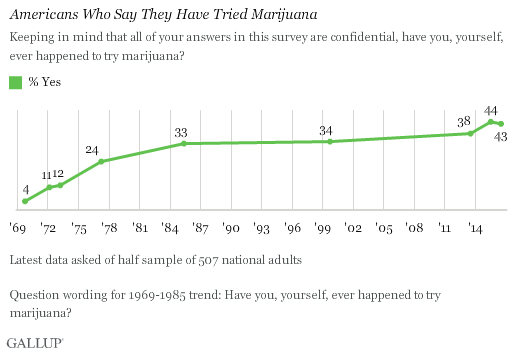 What's interesting is that even when it was illegal in every state, about 1/3 of americans still admitted to having smoked it at some point in their lives on anonymous surveys. Here in Canada, you can only have a max 30 grams with you. You are allowed to carry this 30 games on domestic flights as well. It is well communicated not to try to cross the border into the US with ANY amount of the stuff.